The Gymnasium of Mytilini1 was founded in 1839 after an initiative taken by the Archbishop Meletius of Mytilene. The construction was completed by the end of 1840 and the inauguration took place in November 1841. The economic crisis of 1850, which was a consequence of the destruction of olive trees due to extreme weather conditions (frost), affected not only the citizens but also the wellbeing of the school, which found itself a step away from closing. A year later, in 1851, another natural disaster struck the city of Mytilene. A big fire burned down a large part of the city and almost the entire market. Fortunately, the school was left intact. During that period and until 1863, the school director, George Aristides, ensured that the school had all the necessary teaching staff, a sufficient number of students, a well-equipped library, new courses included in the curriculum and lab instruments for the study of sciences. During 1884-1885, the school numbered 259 students, but the building was in bad shape due to the earthquake of 1867 and it could no longer adequately serve the educational needs of the city. In September 1886, a letter to the Turkish ruler of Mytilene Fahri Bey from the Council of the Elders and the School Board led to the issuing of an imperial law7 which called for the construction of a more suitable educational institution that would serve the increased needs of the city. The project was funded by the donations of Nicholas Mitrelias and Sophocles Vournazos. On 30.8.1887, the new high school was founded by the former Patriarch Kallinikos, the Governor, one member of the Mitrelia family, the chairman of the Authorities, and the Mayor. The new building was constructed on the site of the old building, while it was designed and supervised by the architect Argyris Adalis. On 18.09.1891, the new school was inaugurated by the Bishop of Mytilene, Constantine. In July 1894, Gregory Vernardakis was forced to resign. He was replaced by the eminent scholar Petros Papageorgiou, who worked towards promoting the courses of Experimental Physics, Chemistry and Plant Science. He purchased chemistry and physics instruments; anthropology models; and maps for teaching History, Geography, and Anthropology. Later on and following several renamings already, the school was called the Experimental High School of Mytilene in 1995, the Experimental High School of Mytilene of the University of the Aegean in 2005 and Model Experimental High School of Mytilene of the University of the Aegean in 2011. Old physics apparatus, chemistry lab instruments and other teaching aids, which consisted the equipment of the laboratory of the school, were stored away until 2002. Many of these items had been acquired through fundraising and donations from citizens who were trying to equip the school in order to provide better education to their children despite the Ottoman occupation until 1912. Just by observing the time and the country where these instruments were manufactured, one can perceive the inclination of the school towards new teaching methods. Notably, apparatus parts from the 19th and early 20th century were also found. The instruments were manufactured initially in France, the Ottoman Empire (French Optical House in Istanbul, Germany, England, America and Greece. Several items were even handmade by teachers and pupils of the school. 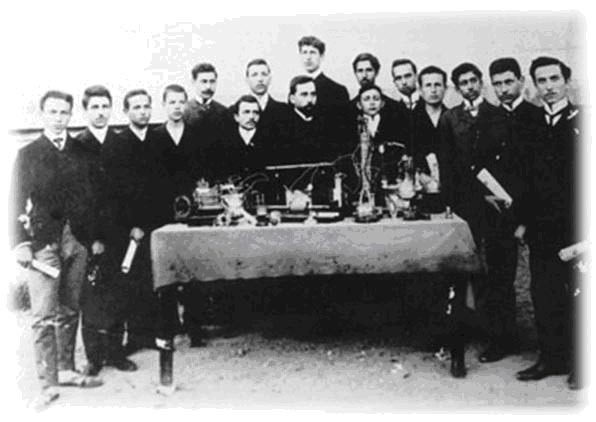 In the black and white photograph taken in 1907, Michael Stefanidis, a teacher at the time and a professor later, can be seen with his pupils around a table set with instruments and apparatus for physics and chemistry. Most of them can still be seen in the collection, and some are even usable.